I recently went on holiday. Well that was meant to be the idea. No sooner had I left Hong Kong than I was phoned about one of the Schools of which I am the Supervisor. Since then I have been on the phone constantly and, if not the phone, then email. For legal reasons, I have to be careful what I say even here. However, this report from the agency WE reported the case to and one of the press reports about it will give you the idea. They are both substantially correct. 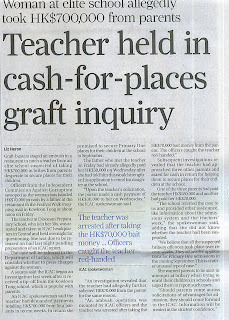 A teacher of a primary school, who is also involved in admission procedures, was caught red-handed by the ICAC yesterday (Friday) after she took a bribe of $70,000 from a parent, allegedly for facilitating the admission of the latter's daughter to the school. The ICAC commenced an investigation after receiving a corruption report. Inquiries revealed that the teacher had allegedly solicited $30,000 from the parent, claiming that it would strengthen his daughter's application for enrolment to the school. Upon the teacher's solicitation, the parent had already made a cash payment of $30,000 to her on Wednesday (July 18). Investigation also revealed that the teacher had allegedly further solicited $70,000 from the parent for the same reason. An ambush operation was mounted by ICAC officers yesterday inside a restaurant in a shopping mall in Kowloon Tong. The teacher was arrested after taking the $70,000 "bait money" from the parent. Subsequent ICAC investigation revealed that the teacher had allegedly approached three other parents and solicited advantages from them, claiming that she could provide assistance in admitting their children to the school. ICAC inquiries showed that two of those parents had allegedly paid the teacher $20,000 and $580,000 respectively. The management of the primary school concerned has rendered full assistance in the investigation. An ICAC spokesman reminds that parents should be cautious when seeking to enroll their children in schools of their preference. "Should parents come across solicitation of advantages for admission, they should come forward to report to the ICAC. "Information will be treated in the strictest confidence," the spokesman says. Once this story broke everything went completely mad. The press and TV camped outside the School, even though it is the summer vacation, and I received many requests for information, even though the matter is subject to legal proceedings. It is a real temptation to think you must react and do something. Plenty of people are clamouring for you to do just that. It is hard to see the wood from the trees at times. In fact, it is all very simple really. A teacher has been arrested, allegedly for taking money to facilitate the entrance of children into the School. If guilty, she will be punished; if not, she will be acquitted. It is not for us or anyone else to pre-judge the legal process and there is nothing for us to say or do with respect to the case in question except to co-operate with the legal authorities. There is, of course, plenty to do in terms of managing the fall-out from the case, but nothing much to do about the case itself. Convincing some people of this takes quite some time! What, however, the case does raise is the question I keep raising and have discussed here, namely the culture around our Christian schools. Leaving this case aside for one moment, the only reason people are tempted to take bribes is because parents are willing to pay them and because we in the Church have cultivated a culture of social elitism. A Christian response I would suggest is, of course, to expose corruption, but it is also to challenge the culture which makes it possible. This may mean Christian schools having to cater more in future for the poor than for the rich. Anyway, the story is going to run and run whether I am on holiday or not. I will keep you informed as it develops and as much as I am able. Please pray that I may have the wisdom I need to handle it properly.